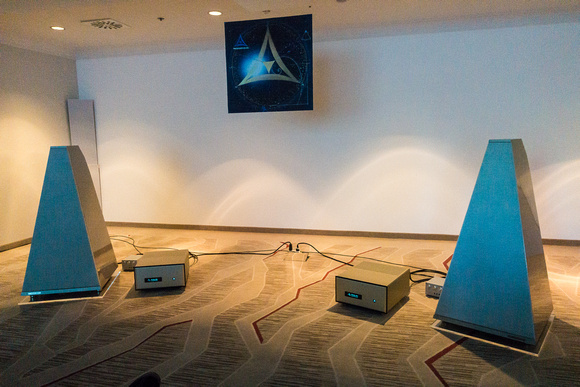 As it happened, there was an alternative audio show in Munich—at the Marriott Hotel on Berliner Strasse in Schwabing—called Hifi Deluxe. Though not approaching the size and variety of the MOC festivities, and lacking their glamor, it was an interesting little gathering in an off-the-beaten-path way. For one thing, it sounded good, in part because the Marriott’s more solidly built hotel rooms were acoustically superior to those partitioned-off, glassed-in spaces at the MOC. For another, the rooms were less crowded and noisy, making it easier to sit and listen. For a third, the alt.show happened to house one of the best sounds in Munich, which we will get to in a moment. Though, for obvious reasons, I didn’t spend the time there that I spent at the MOC, I did do several hours of room hopping, and here are the highlights. 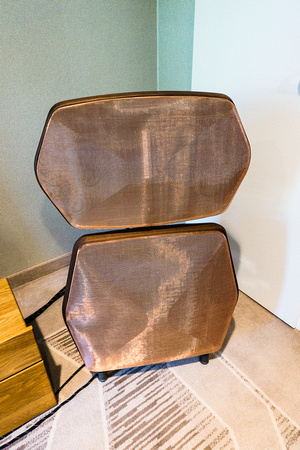 The German company MiTec showed its €25k Private Line MAX 1 electrostatic loudspeaker, which uses industrial ceramics—in the form of an aluminum-oxide ceramic that is welded by an adhesive and a heat treatment to the electrostat’s foil element—to “maximize impulse reproduction and dynamic range.” Driven by Einstein electronics, the MAX 1 sounded quite lovely, actually—sweet, dark, lively, and musical. 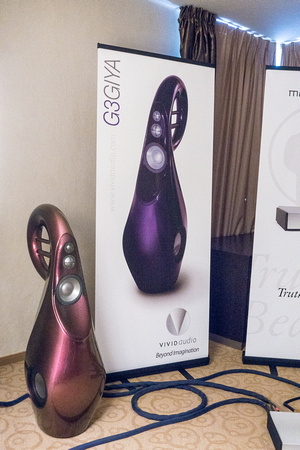 Yet another Vivid Audio loudspeaker, the €43k Giya G3, driven by Mola-Mola, was being shown at HiFi Deluxe. Like the MiTec, it sounded rather dark in balance but, again, like the MiTek, quite lovely on a choral recording, with a very nice sense of ambient space. It had solid bass, too, for such a small speaker, with good organ pedal point—and organ timbre itself, though both instrument and choir were a bit miniaturized in image size. 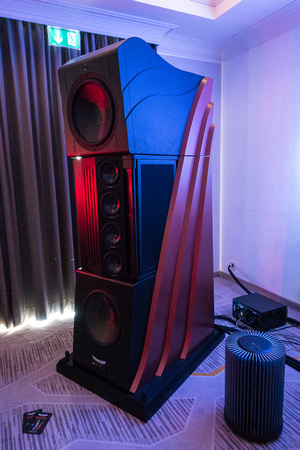 Acapella Audio Arts showed its €26k Basso Nobile horn-loaded loudspeaker driven by Acapella electronics, and it was the best I’ve ever heard an Acapella speaker sound—very dark and rich on a cover of “Michelle,” very hard-hitting on drum and bass. A ravishingly beautiful presentation. SoundKaos was demo'ing its odd-looking €20k Liberation with Grandinote electronics. The speakers reminded me a little of Dahlquists, though better sounding--very fast, open, and hard-hitting. I liked them. AER showed its €68k Pnoe a single-driver front-loaded and back-loaded spherical-horn system that uses AER’s 8” BD4 full-range driver. Despite its imposing looks, the Pnoe was very delicate and airy sounding driven by Arta Forme electronics. Speaking of surprisingly light, neutral, and airy, the gigantic, high-sensitivity €150k Sigma Acoustics MAAT ribbon/cone multiway, driven by MSB and Kondo amplification, sounded just that. As did the Sonus faber Aida driven by Mal Valve, and the €34k Audio Concept Soundwaves Micro XL driven by Elements electronics. Saving the best (and one of the best sounds at either show) for last, Manuel Huber’s FM Acoustics showed the Inspiration System—an entire hi-fi kit that includes four-way loudspeakers with hand-selected drivers, outboard crossovers, FM Acoustics amplification, preamplification, and cables, and is priced at €120k and up (depending on your choice of amp, preamp, and options). On recording after recording the Inspiration exemplified transparency to sources, sounding precisely as realistic or not-so-realistic (Huber deliberately played some flawed LPs) as the recording itself was. I came away extremely impressed. Though I heard more consistently beautiful sounds at the MOC and elsewhere at HiFi Deluxe—and some with better this or that—I’m not sure I heard a more neutral, transparent, or (with the right source) realistic system in all of Munich. For transparency-to-source and absolute sound listeners, this was a sensationally impressive presentation. I should note as well that Manuel demonstrated a very clever scratch-remover built into his FM 122 phonostage (a version of which I reviewed many, many moons ago), which did precisely that—removed the sound of scratches from beat-up LPs without audibly touching timbre, dynamic, or resolution. I have no idea how this magic was accomplished, but magical it was.